By appointment 24 hours notice please. Pellet Estate® produces rare, authentically grown, and classically made wines. The Estate is a spectacular vineyard site in the small town of St. Helena, with a rich history dating back to 1859. Henry Pellet, one of the founding pioneers of Napa Valley winemaking, first planted this site with a vision of producing wines that would be among the best in the world. The flagship wine for Pellet Estate is the Cabernet Sauvignon from the Pellet Vineyard®, a blend of about 90% Cabernet Sauvignon with the balance being Merlot and Petit Verdot. We also produce small coveted amounts of Estate Merlot, and our Henry's Reserve. Our Chardonnay from the Sunchase Vineyard® in the Petaluma Gap is crafted in two styles – an Un-Oaked Chardonnay and a traditional Burgundian barrel fermented Chardonnay. Our vintner team consists of winemaker Tom Rinaldi and director of winemaking Eric Risch. 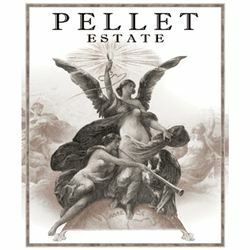 The Pellet Vineyard’s origin begins in 1859, when pioneer winemaker Henry Alphonse Pellet was hired by John Patchett to make wine from his grapes near the city of Napa. Charles Krug had also begun to make wine in 1858, and Henry Pellet became the second commercial wine maker in Napa County. Formally established in 1863, the Pellet Vineyard was among the first vineyards in Napa Valley intended for producing grapes for wine for consumers at large, rather than family & friends. In 1863, Pellet purchased 45 acres of land south of the town of St. Helena next to his neighbor, Dr. G.B. Crane, and planted 38 acres in vineyards. Our label depicts the dawn of the age of electrification, the era when Pellet illuminated the path towards modern viticultural and winemaking methodology, and with it, the high quality and age-worthy wines that define Napa Valley. Tasting in our outdoor pool lounge in the middle of the vineyard, well in advance appointment required. $25 per person, fee waived with 3 bottles or more purchase. Plan on 1 to 1.5 hours. View from Tasting Room: Tasting in our outdoor pool lounge in the middle of the vineyard, advance appointment required. To join the wine club, visit www.pelletestate.com or call 707-363-3281. 10% off all discountable wines.